My mother used to make broth from chicken bones when I was a child and used it as a base for her many soups and other recipes. She would especially give it to us when we were sick and always had a bowl of it in the freezer. She told me my great-grandmother who was born in Devon, England, in 1870, used to drink a cup of beef tea (broth made from boneless meat) every day. She used to say it was a cure-all and give it to my grandmother when she was sick. I have been making bone broth regularly myself, ever since reading about it in Nourishing Traditions (the cookbook that changed my life) and adopting a real food diet eight years ago. I usually make it from chicken bones but if I have leftover beef, duck, marrow or lamb bones I will add them. Oxtail also makes a very rich, gelatinous broth. Every time I roast a pastured chicken, I freeze the bones and when my freezer is overflowing with various containers of bones, I will boil them in my 16 quart stock pot with filtered water and four tablespoons of vinegar for twenty-four hours, according to the recipe in Nourishing Traditions. Sometimes I will also add fresh uncooked chicken parts to make it more gelatinous and nutritious. Then I sift it and store it in glass mason jars and use it to make soups, lentils, beans, vegetables, meat sauce or I just drink a cup on its own. My freezer is always fully stocked with jars of bone broth. I was amazed to learn recently that this real food staple has taken off amongst the fashion crowd in New York City. Along with the opening of Brodo–a take out window serving nothing but bone broth–and a number of butchers and home delivery services also selling it, bone broth is being recommended not only by nutritionists and health coaches but also by beauticians and personal trainers for its many health benefits and skin boosting properties. 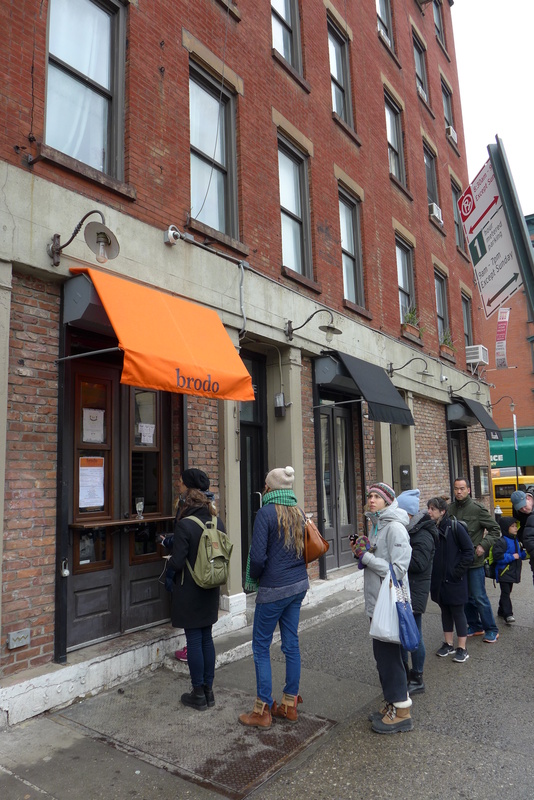 Brodo (Italian for broth), opened last November as an addition to chef Marco Canora’s East Village restaurant, Hearth, serving bone broth from 100 percent grass-fed beef, organic pastured chicken and organic turkey. Canora says he can’t keep up with the demand. So when I was in New York for my father’s birthday, I had to go and check it out. Sure enough there was a queue of people waiting to buy their cup of broth. They had three different types: beef; chicken and a combination of beef, chicken and turkey. You can also get a healthy add-in such as freshly grated turmeric, beet kvass or bone marrow. I ordered the beef broth which was deliciously rich in colour and taste with a hint of fresh ginger. It certainly warmed me up on such a cold winter’s day and I felt well nourished. I was impressed with Marco Canora’s brilliant idea of a take out window, popularising a healthy cup of bone broth over of a cup of coffee. As the real food movement grows, I hope we will be seeing more of these broth bars and fewer places like Starbucks. Sally Fallon, the author of Nourishing Traditions and founder of The Weston A. Price Foundation, has come out with a new book devoted to bone broth: Nourishing Broth. It has also become fashionable in London. The Whole Foods here has an entire section devoted to creating your own broth. I hope this trend continues. I would love to travel the U.S., knowing I could easily find a good cup of nourishing broth wherever I went. Locally, here in Eureka, CA, I can tell stock-making is becoming more and more popular. The local butcher at the food co-op can hardly keep chicken feet in stock, and the prices of bones for stock-making have gone way up, as the demand has increased. Loved it! Looking forward to the next one! !